Location/ Directions: I-30, Exit # 132, just north. 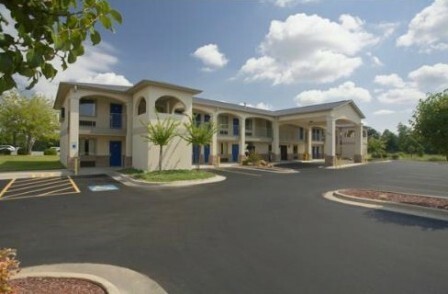 Air Conditioning, Restaurants Nearby, Truck and Bus Parking, No Pets Allowed. Railroad View: Good View. Any room on the front of the motel will offer a railroad view. Railroads past Hotel: Union Pacific. 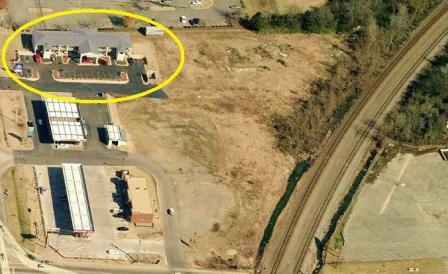 Photo Comment: Americas Best Value Inn is circled in yellow. There is a grade crossing just off the bottom of this photo, trains should blow their horns for the crossing which will alert you to approaching trains.